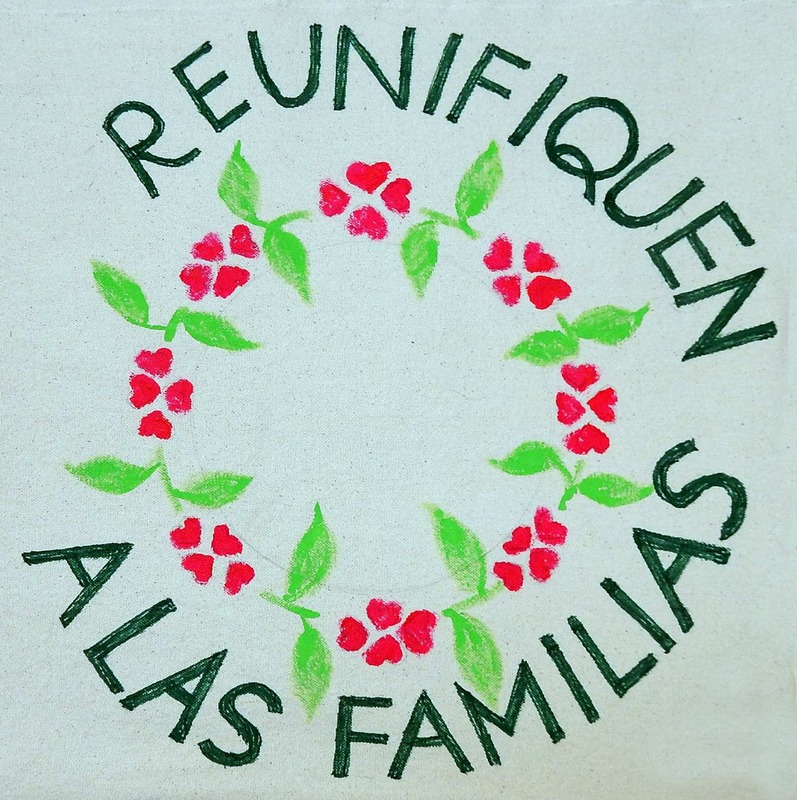 Members to carry solidarity quilt and tsuru to protest family separation in Texas. 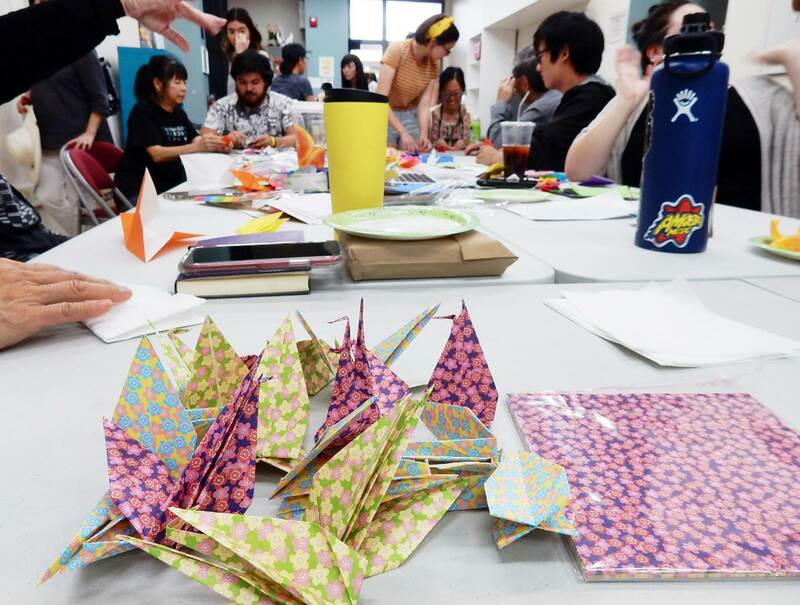 Volunteers fold cranes at the Far East Lounge in Little Tokyo on March 16. Nikkei Progressives (NP) invites members of the Japanese American community to participate in its “Families Belong Together” Quilt Project, which seeks to raise awareness and support for families and children suffering from detention and family separation at the border. As of today, there are still children who are separated from their parents, and toddlers and even infants are being held in detention in places like the “Family Residential Center” in Dilley, Texas. Young children have died while in border control custody or shortly after leaving detention centers. Pediatricians have warned about the long-term psychological, cognitive and emotional impact detention and family separation will have on these children. 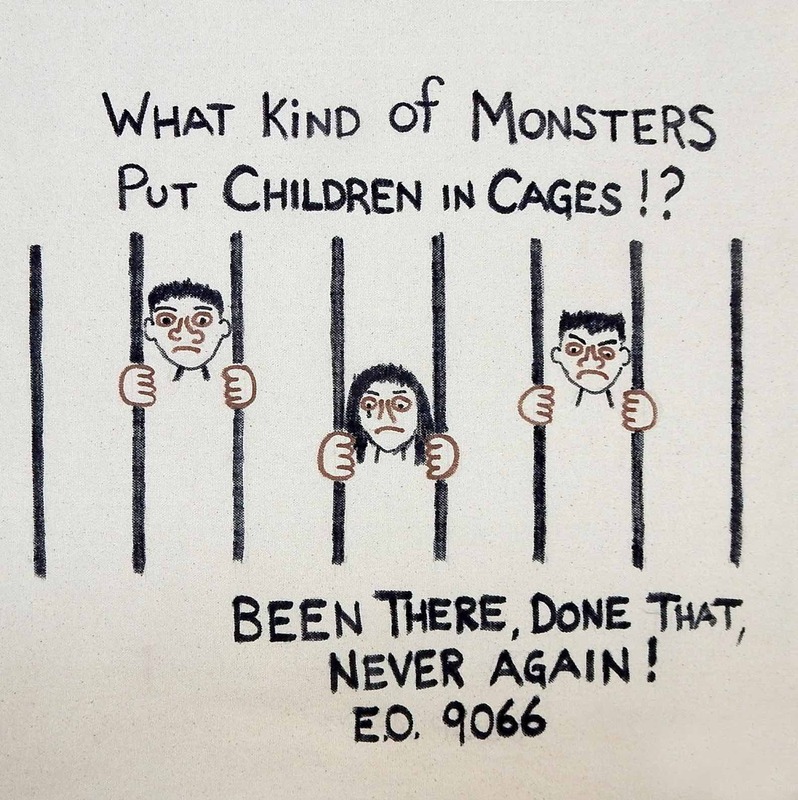 On March 30, NP members Tony Osumi, Jenni Kuida and Sean Miura will join Japanese Americans from throughout the country to protest against the incarceration of immigrant families and children at the family detention center in Dilley. NP’s quilt with messages of solidarity and support will be displayed, along with over 1,000 tsuru (cranes) folded by NP members and supporters this past week. Over 10,000 “Tsuru for Solidarity” will be hung on fences at the Dilley site. Above and below: Squares from the “Families Belong Together” Quilt. NP is asking for community support to continue the quilt project. More contributors are needed so that additional quilts and banners can be made. These will be displayed at community events and marches and rallies in support of immigrants and against detention. Donations can also be made to help detainees, reunite families, and assist Deferred Action for Childhood Arrivals (DACA) recipients. NP will hold workshops for any groups and individuals who would like to get involved in the quilt project. Canvas squares will be distributed and can be painted, appliqued, decoupaged or hand drawn. Digital files can also be printed onto the canvas. Poetry or other messages can be incorporated. Participants need not be artists or even have artistic skills to participate. “Please join Nikkei Progressives in creating a beautiful statement of support for immigrants and refugees whose only crime is trying to protect their loved ones by escaping violence and poverty in their home countries,” organizers said.